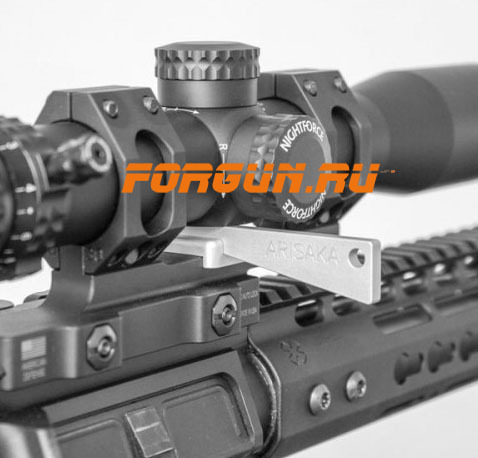 Arisaka Optic Leveler - недорогой, простой в использовании инструмент для выравнивания прицелов, при установке на кольца и моноблоки. В середине прицела, обычно, есть утолщение на центральной трубке. В месте слияния прицела и турелей введения вертикальных и горизонтальных поправок. Низ этого утолщения, у большинства прицелов, плоский снизу. И планка Вивер/пикатини и т.п. так же плоские. Они максимально точно повторяют горизонталь прицельной сетки прицела или оружия. С помощью этого инструмента, можно выровнять по горизонту прицел и поверхность под ним (в случае если они позволяют). В случае если это моноблочный кронштейн, он чаще всего то же, имеет плоскую поверхность. 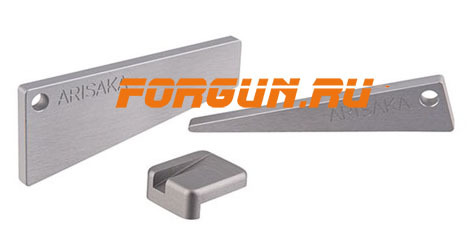 The Arisaka Optic Leveler is an inexpensive, easy-to-use tool for leveling scopes mounted in rings or one-piece mounts. The base plate sits on the Picatinny rail or one-piece mount just below the turret cluster of the scope, and then the matching wedge is inserted from the side. As the 11 degree ramped surfaces of the wedge and base engage, the top of the wedge rises upwards and contacts the turret cluster, automatically leveling it. This updated version includes an offset slot in the leveler base, which helps provide more leeway on one-piece scope mounts that have ramped surfaces, such as the Aero Precision Ultralite mounts. 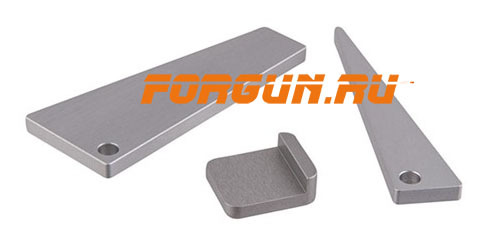 This product includes the leveler base and both small and large wedges. The small wedge requires a space between the rail/mount and turret cluster from 0.190" to 0.730". The large wedge requires a space between the rail/mount and turret cluster from 0.680" to 1.200". Please note: some one-piece scope mounts like those made by Bobro may not have enough space, so be certain to check with your specific scope and mount. The leveler requires a flat surface directly below the turret cluster to function. 1. Place scope in rings or one-piece mount. Tighten rings to remove slack, but leave loose enough that the scope can still be rotated by hand. 2. Place the leveler base on the Picatinny rail or one-piece mount directly below the turret cluster of the scope. The angled slot should be on the top side. 3. Insert the leveler wedge into the slot on the base from the side until it contacts the bottom of the turret cluster. 4. Gently apply pressure to the wedge until the scope rotates and is leveled. 5. Tighten one scope ring according to the torque specifications provided by the ring/mount manufacturer. 6. Remove the optic leveler. 7. Tighten the other ring according to the torque specifications provided by the ring/mount manufacturer. Use of the Arisaka Optic Leveler makes the assumption that the scope's turret cluster and reticle are aligned, which may not be the case with poor quality scopes. 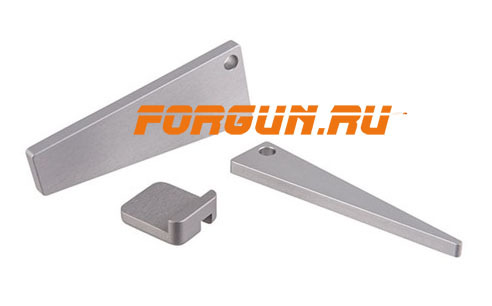 Material: 6061-T6 clear anodized aluminum.